"The Grand Cities", "The Forks", "The Sunflake City"
Grand Forks is a city in the U.S. state of North Dakota along the Red River of the North. It was founded by Alexander Griggs on June 15 1870. It has a population of slightly over 50,000 and is now the county seat of Grand Forks County. 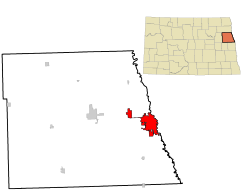 It is the third-largest city in the state after Fargo and Bismarck. Across the river is East Grand Forks, Minnesota. This page was last changed on 24 May 2018, at 07:31.